What’s it like to be a single mom, just out of an abusive marriage, forced to live several years hungry, with the pervasive fear of losing your lodging, custody of your child, or maybe even your life? Can you even imagine living paycheck to paycheck, netting below minimum wage while cleaning other people’s toilets, feeding your little girl whatever you could, stretching WIC allowances, while you had little more than a few cups of coffee to get you through the day? For several years, Stephanie Land did this, and dealt with other unimaginable crises on a day to day basis with a strong will to survive. Yet she set goals: to finish college; to move to Missoula, Montana; and to become a writer. That homeless shelter became their temporary home until Stephanie learned how to work the system, to get government assistance, and yet how to shuffle that assistance—though meager—so she could get whatever services she needed for her daughter (and some for herself), until she could get on her feet. Stephanie took college courses and studied, exhausted at night, weekends or whenever her daughter visited her mean-spirited dad. Mia, Stephanie’s little girl, was often ill because their tiny, studio apartment—where they shared only a twin bed—was full of mold. Stephanie often had to miss work—along with the much-needed earnings—to take her daughter to doctors and for surgery to deal with the ramifications of the mold. But she couldn’t leave just yet. We are often left with images we want to clear out of our mind after putting the book down for a moment. 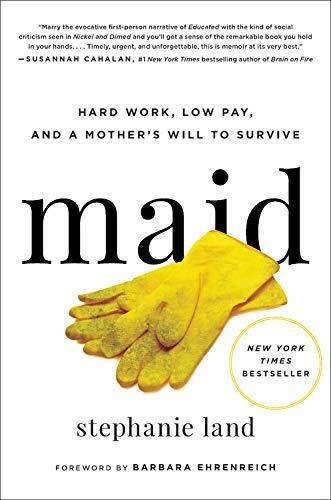 Though we rush to pick Maid back up in the hopes there will be a happy ending for this beyond-hardworking woman. Occasionally there would be flickers of brightness, like learning about government scholarships that finally allowed Stephanie to move from the mold-trap temporarily into a two-bedroom apartment. Although the rent was too high, she bartered her cleaning and landscaping services with the landlord, though this didn’t work out for long. Through the Women’s Independence Scholarship Program (WISP,) Stephanie was finally able to slowly begin the path to fulfilling her dreams of moving from Washington State to Missoula, Montana, graduating college, and becoming a writer. In her case, hard work and sacrifice did pay off. A fierce survival instinct comes through on every page of Maid. This is a must-read for lovers of beautiful, simple prose (“Most of my days seemed to drift, like a boat with a broken motor, through a thick fog. At times, the thickness would lift a little; I could see, I could think, I could joke . . . and feel like myself for an afternoon,”) and for anyone who might have walked in Stephanie Land’s shoes.